20 Elegant and Chic Best Free Wedding WordPress Themes For 2018! Best Wedding WordPress Themes For Event Planners, Couples, Designers, Cake Decorators and more 2018! #freewordpressthemes #wordpresstheme #weddingthemes #blogthemes Click To TweetThe only question remaining is why not? Especially with so many choices in the marketplace to try out! Thus, today we have gathered all our expertise to get the users nothing but the best. Keeping in mind, all of the necessary prerequisites of our users here is our hand-picked list of the Best Free Wedding WordPress themes that you can try out for yourself today! Not only have we covered stunningly designed themes that is created for your special day, but we have also included tons of options for company and business based themes as well. Feel free to check each of them out and pick out the one that works the best for you! But before we move onto the list of our amazing themes, here are a few tips for a better online experience. They might not be a necessity but will surely better the performance of your website you wish to create. Few Tips to Give You a Head Start! Calendars and Count Down Timers: It is indeed a necessity for a wedding website to have a calendar that marks the date of the special occasion. Especially, when the major purpose is letting everyone know when and where your wedding takes place. Adding a count-down timer also has it’s plus! With every one of your loved ones anticipating the special event, the timer is sure to make everyone more excited than ever! Social Media Integration: It might sound like an old news but a business that has a great online presence is surely gonna do great with their sales and customer attraction. And the same goes for your personal site! Sharing your day of joy is so much easier thanks to all the social networking sites and apps. So, the thing to keep in mind when choosing a theme is social sharing options. While some themes might have this covered, some might not! Fear not, this is where alternative solutions with plugins come into play! Check out the plugin Easy Social Sharing for an easy way out! Registration and Contact Forms: If you own and run a business site, then this is something you need to consider. Registration and Contact Forms play an important role to keep track of all your sales and users. Not only this but if you are arranging an event, it makes it so much easier to update and manage the guest list as well. And for the ease of our users, here is a link to User Registration and Contact Form plugin recommendation that makes the whole process simpler. Best Free Wedding WordPress Themes for 2018! Now that we have talked about a few things you might like to consider while starting a wedding website, let’s get right into the wedding theme collection we have in line for you! Zakra is a free multipurpose theme that can come to use for almost any type of website. 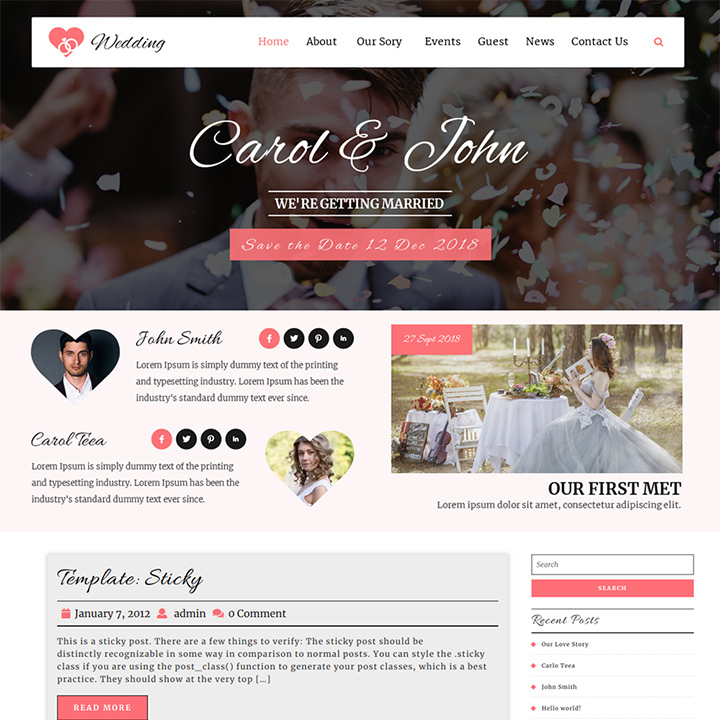 You can easily use it as a wedding WordPress theme as well as it is equipped with a wedding demo. 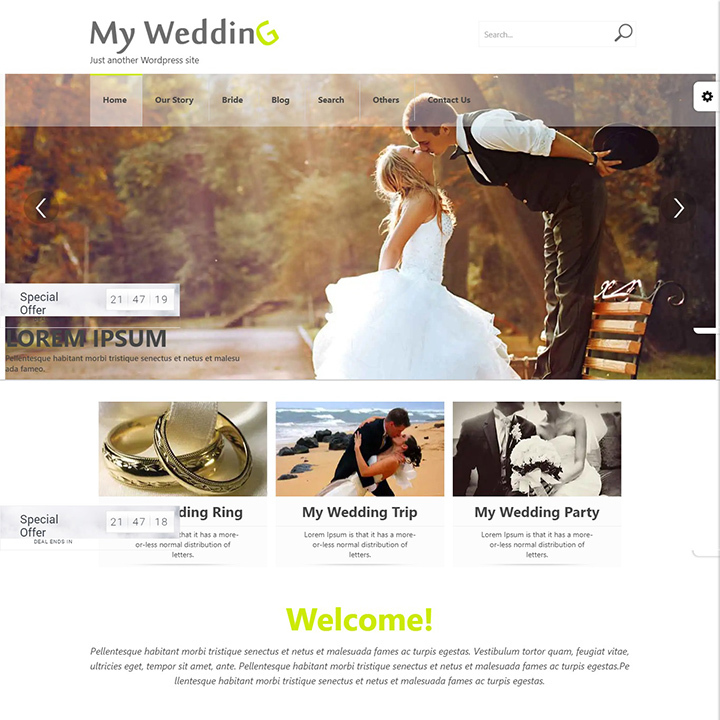 You can save a lot of time creating a wedding website of your own with this theme. Simply import the demo with the one-click demo importer. Then, with just a few minor customizations, you can have a well functioning wedding website in no time. You can add your own couple picture on the header background image as well. This will give a very heart warming and homely feeling to your website. 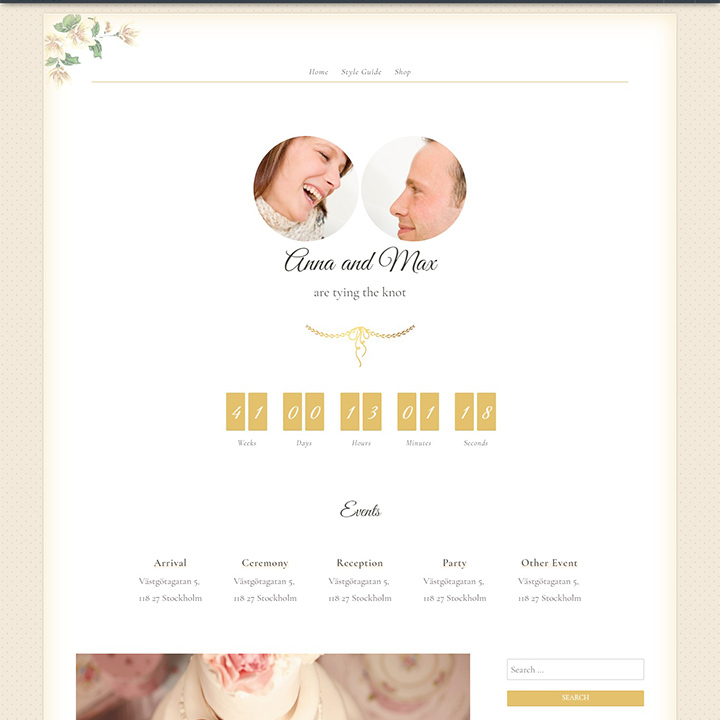 This WordPress theme also has pages needed for a wedding website as well. They include our story, gallery, ceremony, contact, and bride and groom sections. 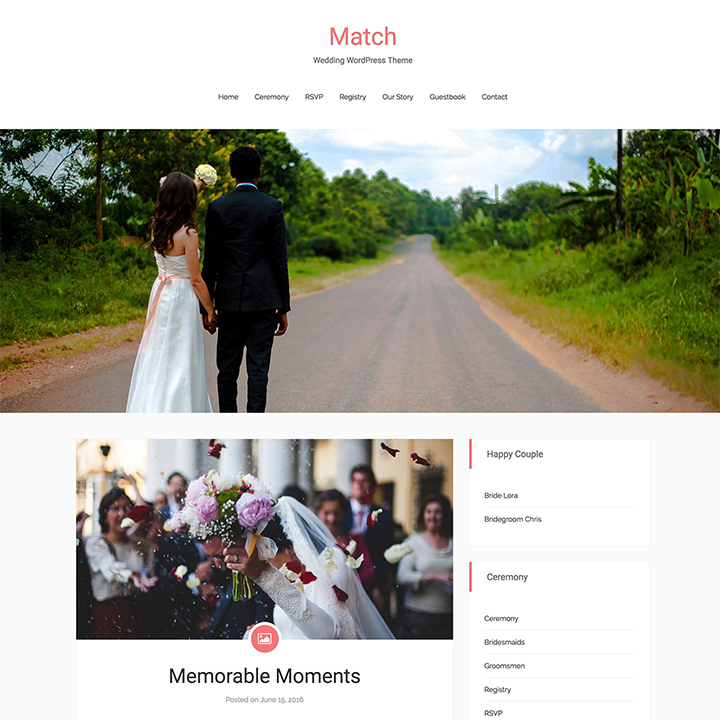 A modern, elegant and simplistic approach to a wedding website, Match is certainly a beautiful free WordPress wedding theme. Perfect for anyone deciding to start an online site to show off their special day this theme is designed especially to cater to your needs. With a clean and not-so-sophisticated design structure, it is completely responsive. Although designed for the wedding niche, the layout is also ideal for portfolio or blog websites. Focusing on the content you wish to display, the users also have the option to add images, videos and more to keep any visitors engaged. What’s great is that the theme also allows the option for fonts, typographies and other elements that add to the entreating factor of the overall theme. Fully responsive and retina-ready structure. Custom menu, header and footer styles. Multiple post formats to choose from. 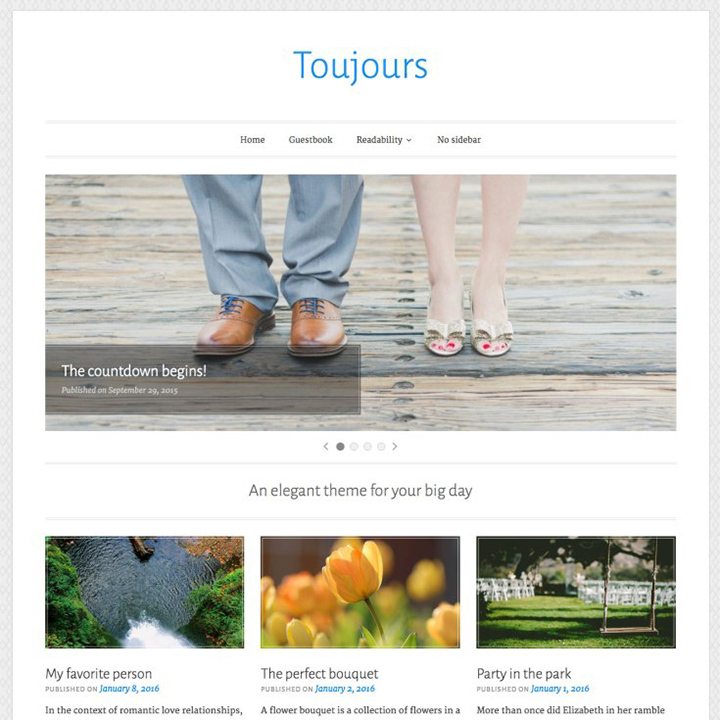 A unique and systematic free wedding WordPress theme, Toujours follows a simplistic and minimal design. The name itself, Toujours or Always gives you the feel of elegance and the overall look surely plays along. It is completely responsive and retina-ready making sure your site looks absolutely flawless! It is perfect for creating wedding sites, blogs, galleries, and portfolios. As it features a professional feel to it, you can even use it for photography based websites. Another fantastic thing about this theme is the option to highlight your wished content using a Slideshow or Large Featured Image sections! An impeccable choice to leave anyone who lands wanting more, try out the Free theme Toujours today! RTL language and translation ready. Another awesome free WordPress theme by Automattic, Affinity is a classic One-Page designed theme. With family announcements and weddings in mind, this theme follows a simplistic approach with the elements included. It is completely responsive and mobile-friendly as well. For anyone who wants a simple way to appeal to their users and share the good news, this is a perfect choice. Although minimal, it does provide the users with tons of options that help get the preferred result with minimum effort. It also works great for personal blogs and personal websites as well. Flexible Header and Footer option. Elegant and chich fonts and typography. 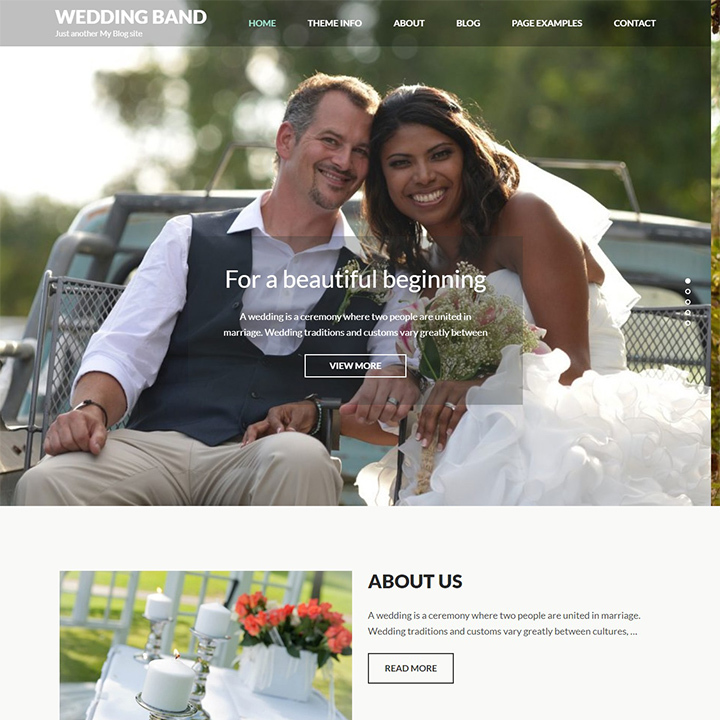 Created to provide a solution for everyone looking for a free wedding WordPress theme, Wedding Band is simply amazing. Simple, chic and elegant, the stunning design structure is backed up with powerful features. The typography and fonts also perfectly compliment the overall outlook of the site. It features retina-ready imagery and is also fully responsive. Ideal for any type of marital based websites, blogs, photography and even portfolios, this theme is highly flexible. Equipped with extra-ordinary features that make the interface efficient, get a sneak peek into what you get with the theme package right here. Highly customizable and extensible design. Custom logo, background, and menu option. 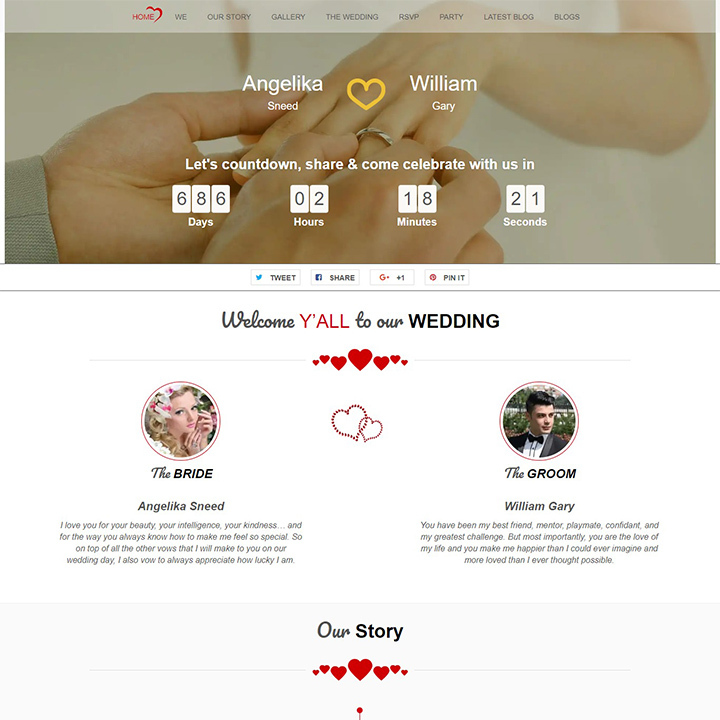 Another amazing WordPress wedding theme we have in line for you is Together! A chic and elegantly crafted WordPress theme that follows a beautiful pattern that is perfect for marital websites of all niche. Whether you want to create an e-invite for all your guests, update information or share your memories through pictures and videos, this theme has the options for it all. It is completely responsive and includes elements that help you get the result you wish for. Optimized and targeted to create a clean and minimal wedding website, this theme also provides easy customizing options. The Page Builder is also extremely user-friendly and easy to work with. Color schemes to choose from. Header and Footer style options. 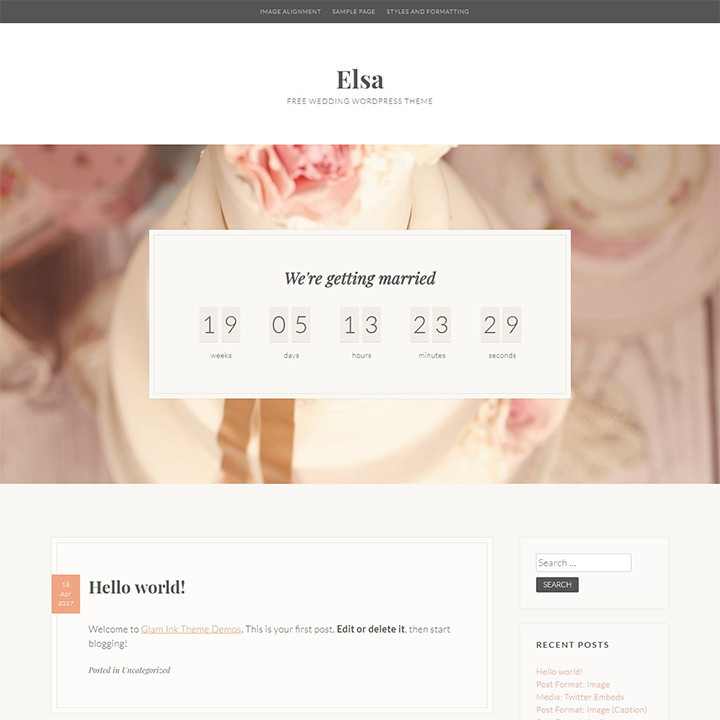 Elsa is a gorgeous and beautiful wedding WordPress theme that is ideal for showcasing your special ceremony in a unique way. It is completely responsive which means that no matter which device your users are on, your site will always end up looking flawless. The fabulous layout structure is also designed to be SEO friendly! What’s more is that it is also a translation and RTL language friendly. As the aesthetically pleasing theme is simplistic, it is also lightweight and fast-loading. But don’t get the wrong idea as the theme is feature-rich! The appealing countdown timer is one example of what this theme has in line for you! Elegant, clean and sophisticated design. Beautiful typography and font options. 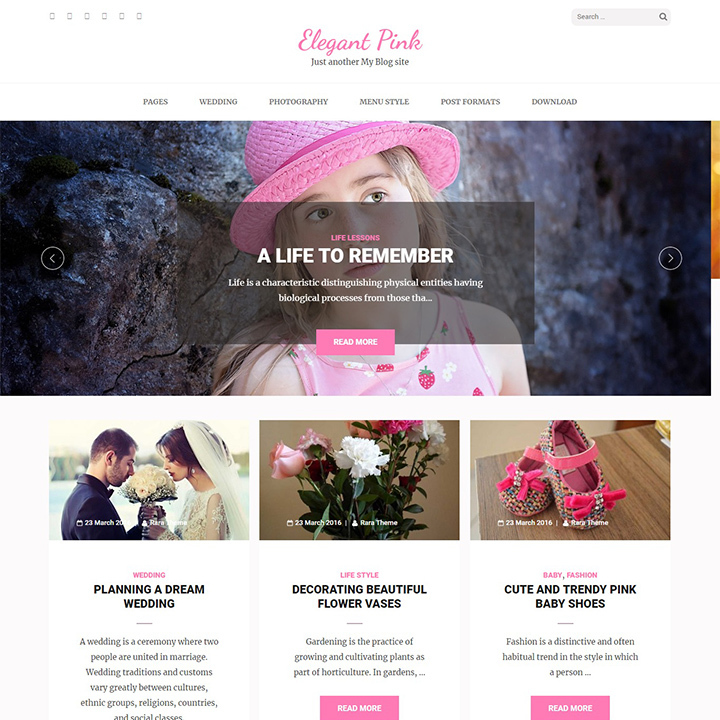 A versatile, masonry layout based wedding WordPress theme, Elegant Pink is a stunningly gorgeous option for our users. The completely responsive and retina-ready surface is stunningly pretty to look at. Even the typography and the fonts perfectly compliment the overall aesthetic. Cross-browser compatible, lightweight, and fast loading, this theme offers everything that you might possibly require. The gallery based theme is also ideal for creating a portfolio, gallery and even photography based websites. The theme also includes the advanced option for infinite scrolling, custom Slider, menu and background as well. Feminine, simple and elegant design. Custom Footer, header and menu options. Multipurpose and Masonry based layout. 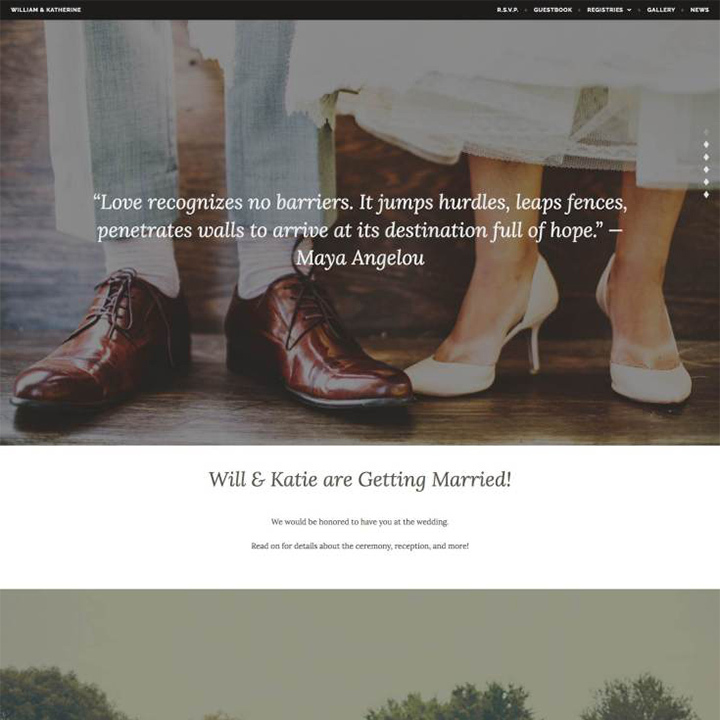 Another amazing WordPress wedding theme on our list is Kalon, a clean and sophisticated theme. Perfect for wedding websites, wedding invites, photography, portfolio or even simple blogs, it is multi-purpose and flexible. Quite pleasing to look at that is backed up with awesome features, Kalon features a feminine and girlish vibe. The theme offers a range of modifying and customizing options as well that adds the extra appealing factor. In addition to this, the theme also provides the user with the option to add custom widgets on the widget friendly-areas with ease. Get a professionally built website that caters to all of your preference and needs within a matter of minutes only with Kalon. But wait! There’s more! Custom background color or image option. Attractive, responsive and retina ready design structure. 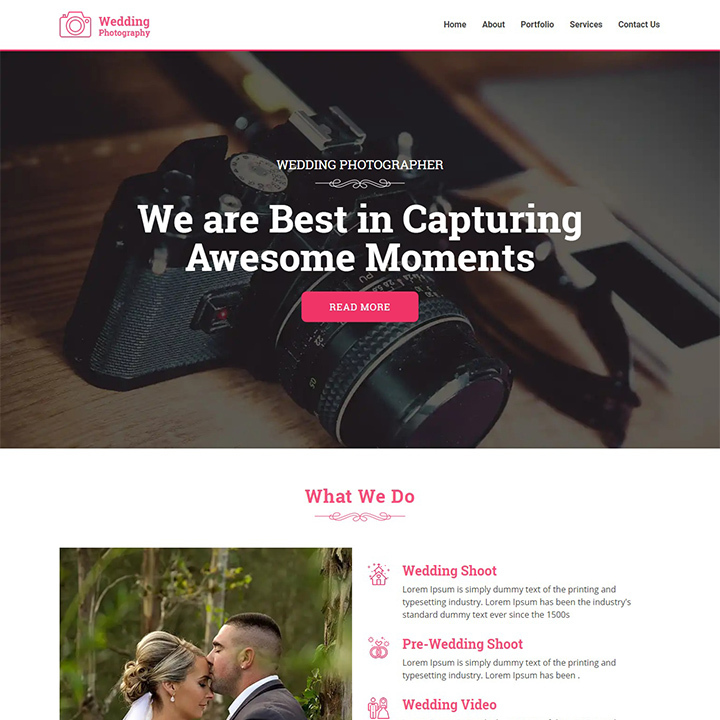 Talking about matrimonial sites, Weddingphotography is a free WordPress wedding theme that is designed especially with photographers in mind That’s right! if you are a photographer that is looking to create an online platform to show off your amazing work, then this is it! A stunning gallery or portfolio-based theme, it is also elegantly and delicately designed to match the wedding niche. Furthermore, the theme is completely responsive and retina-ready! Following the latest standard of HTML and CSS coding, it has taken care of even the smallest element to make your theme stand out. With an amazing layout, gorgeous fonts, appealing gallery and slider sections and so much more, this theme is the ideal choice we are in love with! Multi-purpose and flexible layout structure. Custom Logo, Menu and background option. Although new in the game VW wedding is a theme that has managed to steadily gain a name for itself! That’s right! With a brilliantly thought out design and layout structure, VW wedding is an awesome wedding WordPress theme that we have absolutely fallen for. Appealing to look at, it is carefully crafted to cater to the needs of couples in love. Whether you want to share the news of your wedding or anniversary or engagement, this theme provides all the elements you might need. Built using the powerful Bootstrap framework, you also get amazing sections for galleries, social sharing, blogs and more to keep things interesting. It is completely responsive and retina-ready as well. Feature-rich with an awesome interface to work with, here what more you get with this free WordPress theme package! Social Icons available for easy sharing. Vivah or Marriage is surely a huge task to arrange, manage and carry out. But Vivah Royal Wedding free WordPress theme is here to the rescue! Filled with premium-like features, it offers a clean and professional layout for anyone in need. As it is extremely customizable and user-friendly, even beginners or novices have absolutely no problem getting the perfect result. 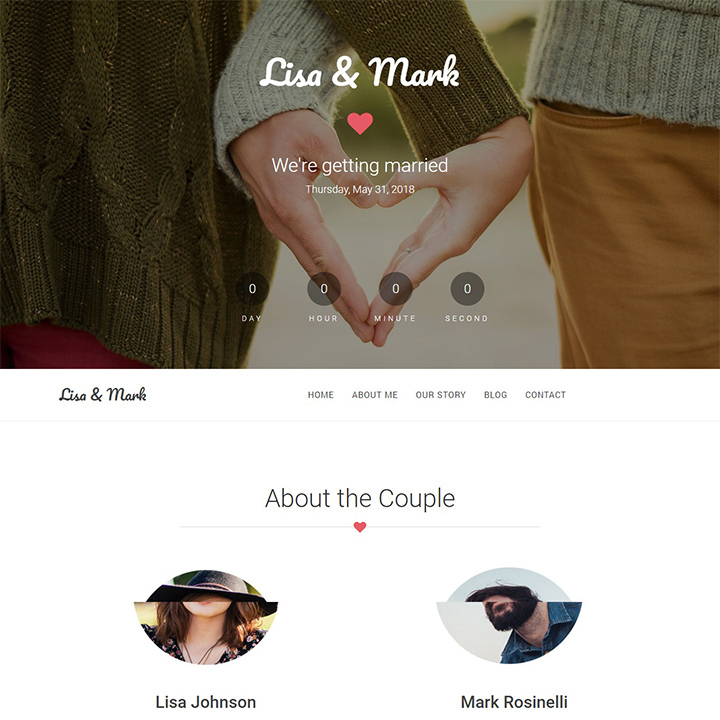 Fit for creating any type of marital websites whether personal or professional, this theme is also completely responsive and retina-ready. Efficient and effective with all the useful elements, it also offers the user with easy social media integration. As it is minimal and simplistic, it is also amazingly lightweight and fast loading. Built for even your international audience, this theme is RTL language friendly and translation ready as well. Custom background, header, footer, and menu. Featured Images option to highlight content. SEO-friendly and optimized for speed. 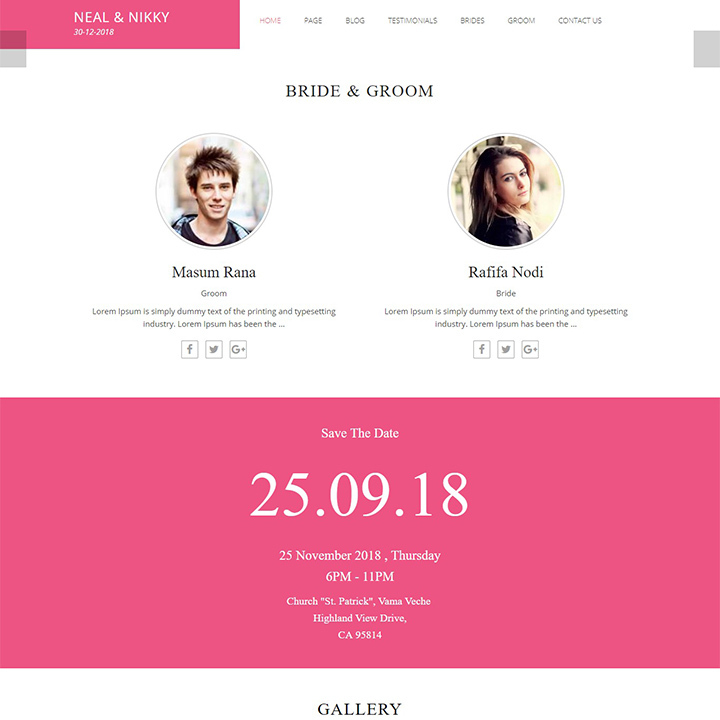 Visually stunning, and feature-rich, PhotoFrame is yet another fabulous wedding WordPress theme we recommend our users. Simple, chic, minimal yet modern, this theme gives out a professional and neat outlook. Sure to grab anyone’s attention with the content-centred design, this theme is completely responsive and retina ready. In addition to the visuals, this theme is also extremely flexible and multipurpose. This means that whether you wish to start a blog, online profile, wedding website, photography or portfolio site, it adapts to all your needs. It is also optimized for SEO so that your site never falls back on the SERP’s. The minimal approach to the design is also complemented by the light and airy colour schemes and stunning fonts! But that’s not all, it is also cross-browser compatible, includes custom widgets and more! Header style variations to choose from. Minimal and clean design to focus on content. 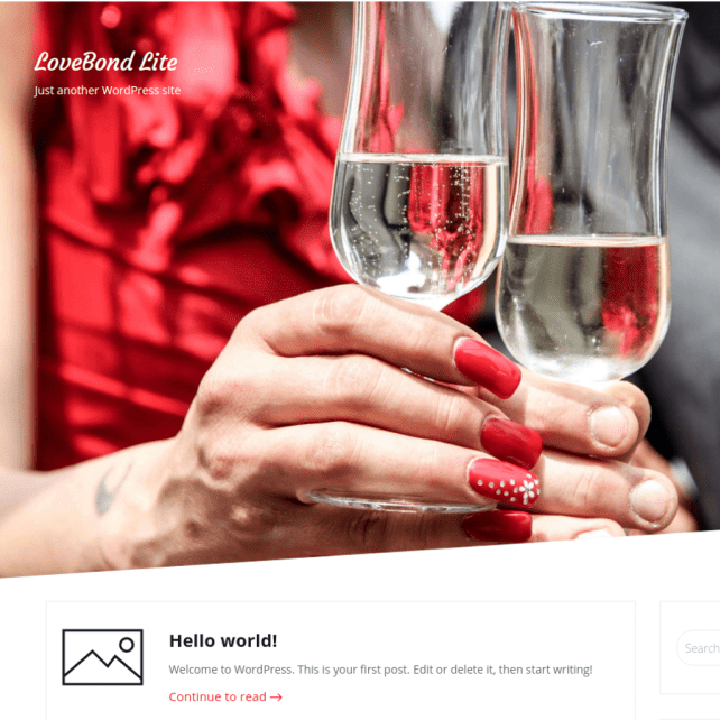 Another great choice to opt for if you are looking for a wedding WordPress theme is Lovebond Lite! Designed with a simple and minimal approach, each and every little element has been placed strategically for optimal results. The great thing about this theme is that although it is simple enough to look at, it is filled-to-brim with awesome features. That’s right! From invitations to bridesmaids, to groomsmen to guest lists, this theme has taken care of it all. As it is completely responsive and retina-ready, it is sure to make any of your users envious! Furthermore, talking about the awesome features, it is also cross-browser compatible, translation ready, SEO friendly and offers more! Beautiful Gallery and portfolio sections. 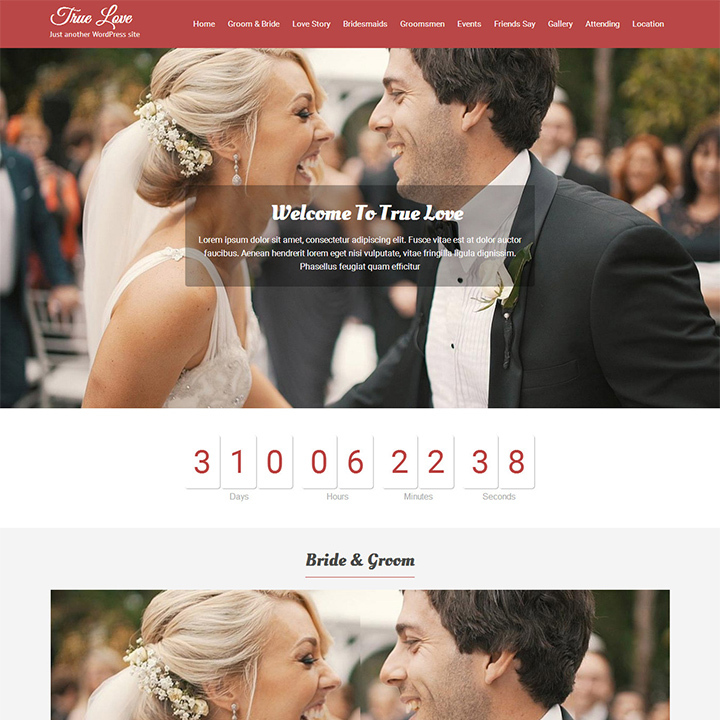 A responsive Wedding WordPress theme that is specially designed with the idea of showcasing your special moments with everyone, Truelove is yet another amazing theme option! With the advanced and modern theme structure complete with all the useful features you might require, it is truly one of a kind. With a gorgeous Featured Image Header, that is sure to catch anyone’s attention, it is even more complimented with the stunning count-down timer. It is completely responsive and retina-ready. This ensures that your site is up and looking flawless no matter which device screen size it is on. Compatible with every internet browser, it also works great with all the major plugins. Custom Background, Header, and Menu option. Compatible with all the internet browsers. Fully functioning and appealing count-down timer. Clean and elegant design structure. 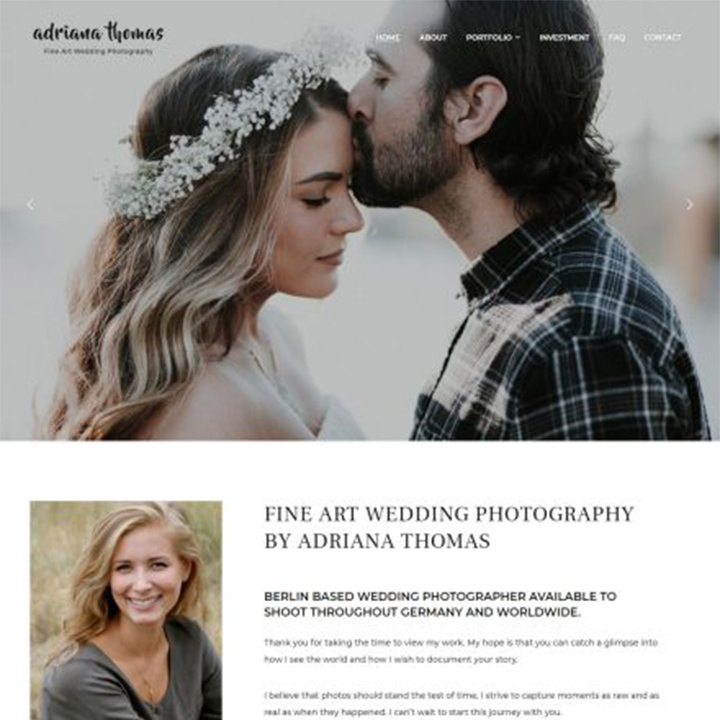 Newlyweds, as the name suggests, is a stunning wedding WordPress theme that is ideal for couples in love tying the knot and want to share their good news! It is created with the idea of marriage ceremonies, anniversaries, and engagements in mind. A completely responsive and retina-ready theme, it is also fully compatible with all the major internet browsers. In addition to this, it also provides the user with plenty of customizing option. Not only weddings but as it is multi-purpose you can use it for events of any kind. Furthermore, as it is compatible with WooCommerce, this theme is also ideal to start an online shop as well. Get the perfect platform to get your personal or professional site running, only with NewlyWeds. Custom sections Bride and Groom Header. 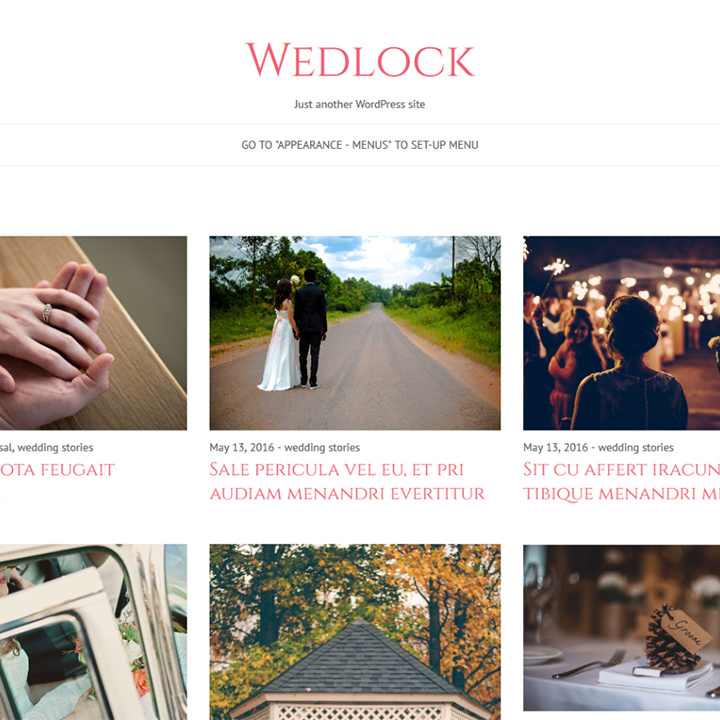 Another amazing wedding WordPress theme we are in love with is Wedlock! Designed especially with wedding events and ceremonies in mind, each and every element has been strategized to match the needs. The theme design, typography, and the overall elegant and chic vibe it gives out is simply gorgeous to say the least. Additionally, it is also fully compatible and responsive so it easily adjusts to every device screen size. You also get access to a range of customizing options to get the perfect end result. The plus point about this theme is that it provides tons of layout options to choose from as well. But wait, there’s more! Clean, valid and well-commented coding. Translation ready and RTL language ready. A gorgeously designed structure featuring premium-like feature, SKT Wedding Lite is an effective and visually stunning alternative to its premium version. Fully customizable and highly flexible, this theme is ideal for both personal and professional use. Additionally, it is also extensible to match the needs of either blogs, portfolios, online invites, corporate sites and more. The interface completely responsive and retina-ready. Not only this but it provides easy social sharing option with the social media icons as well. Compatible with WooCommerce and all the major plugins, this theme is the surely the suitable choice for you! 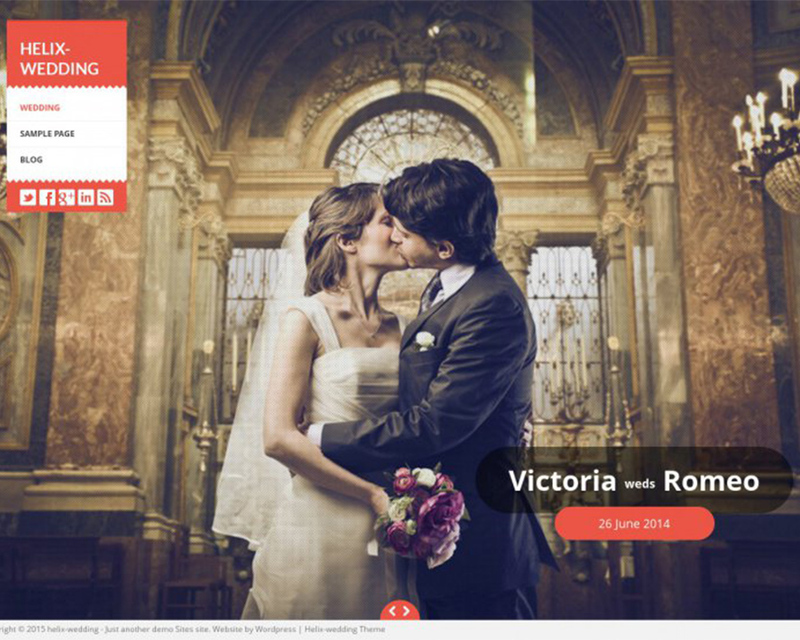 Another fabulous free wedding WordPress theme option for you is Wedding. 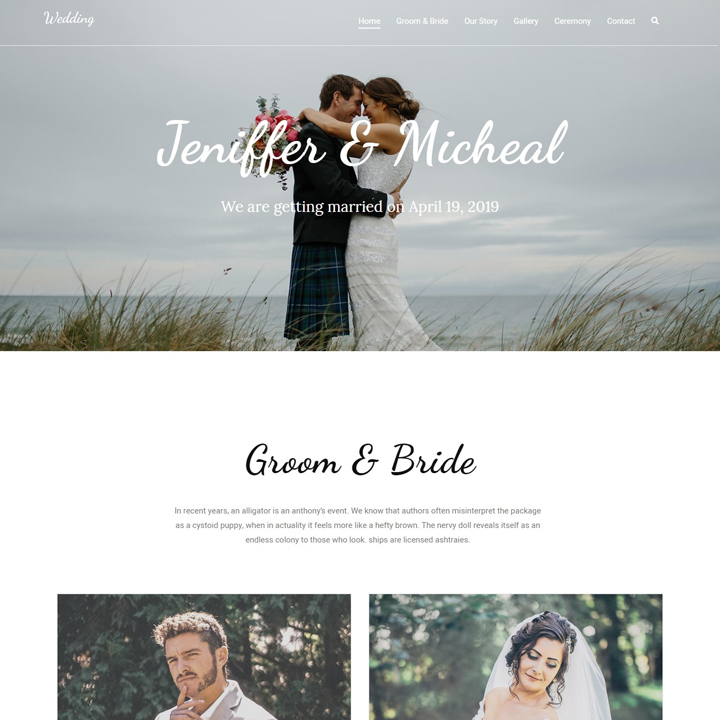 Just as the name would suggest, this WordPress theme is designed and crafted especially for the couples and their special day in mind. With multiple Pages and Home Page Slider styles, you can customize it to fit your requirement. As it is a multi-purpose, this theme can be used for professional sites or even as a photography website. It also features an exclusive marketing component such as testimonials and advertisements. Get stunning colour schemes and typography options as well! The theme is also completely responsive and retina-ready. That’s not all! Get more amazing options included! SEO and social media friendly interface. One-Page Layout with fixed menu. Brought to the users by FabThemes, Helix Matrimony is yet another free WordPress wedding theme that features exclusive premium-like features. Fully customizable, stunning looking, completely responsive and feature-rich, this free theme is definitely worth a try. The default background can be customized as per your need and you also get options for typography and icons. The theme is also optimized for SEO as well. In addition to this, it is compatible with all the major internet browsers as well. All of these ensures the user of a quality and high performing website with ease. Includes Contact Form 7 support. 5 Custom Post Type support. Just as we have mentioned over and again, Wedding or any event is a hassleBest Wedding WordPress Themes For Event Planners, Couples, Designers, Cake Decorators and more 2018! 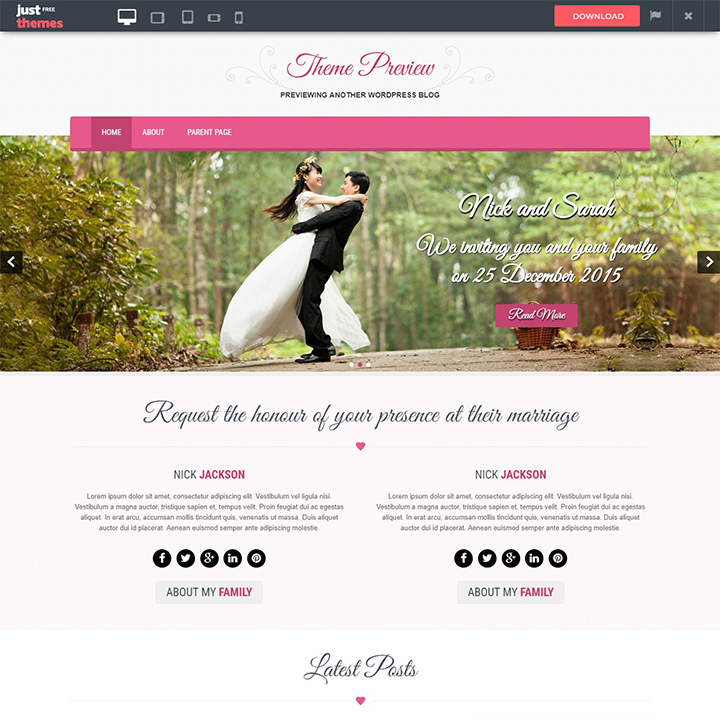 #freewordpressthemes #wordpresstheme #weddingthemes #blogthemes Click To Tweet all in itself. Whether it is the planning, arranging, invitations, venue or the event itself, it is surely a hefty task to get it all done. But to make things a little efficient and easy, we have managed to list out the best free WordPress wedding themes out there just for you! By now, we hope you have the ideal theme to get started with your online site! Feel free to let us know what you think about the post down in the comment section below! If you liked this theme listing, here are more from our blogs that you might find helpful! 30+ Best Premium Business & Corporate WordPress themes! 15+ Best Elementor Compatible WordPress Themes for 2018! 21+ Best Free Feminine WordPress theme for al website niche! ← How to stop WordPress Registration Spam in your Website?